For those of you who may remember this... Cocoon , this is the end result after months of waiting. Yes it was worth it. For the past two or three days now, the cocoon had been taking spells of violently shaking within the glass jar, obviously something was about to take place soon. Though I had my camera ready and hoping to capture the moment of emergance, it did not happen. I was going about my daily routine and just happened to think of checking on the cocoon. These things happen quite fast because only an hour, maybe two or so earlier I had just checked on it, as it was doing its "shake, rattle, and roll." 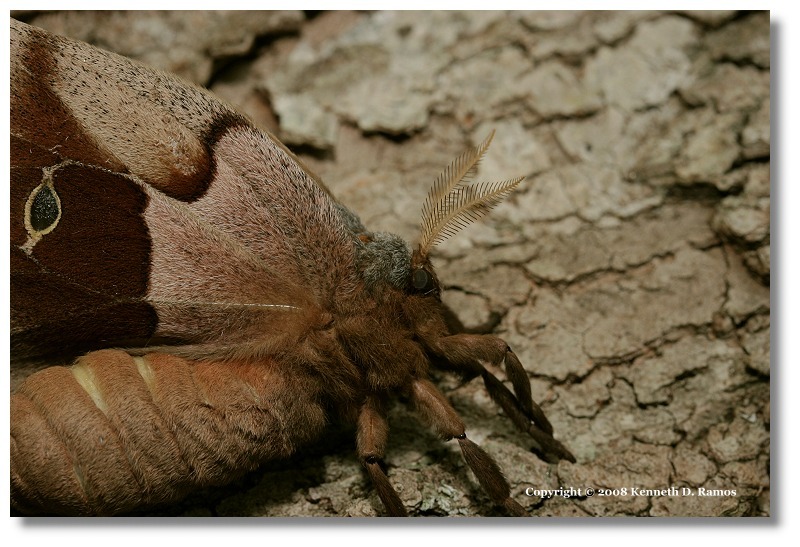 The moth was quite fat and the wings appeared as to the likeness of a fine chamois, though dark brown like leather. It had exited through the very top of the cocoon, through a hole no larger than the diameter of a pencil. The wings hung limp and I only got a peek between them as it climbed on to my hand with those big hairy legs. Sort of reminded me of a SPIDER! A big one at that but I could not help but to feel a sense of joy as it stopped and came to rest on my hand. 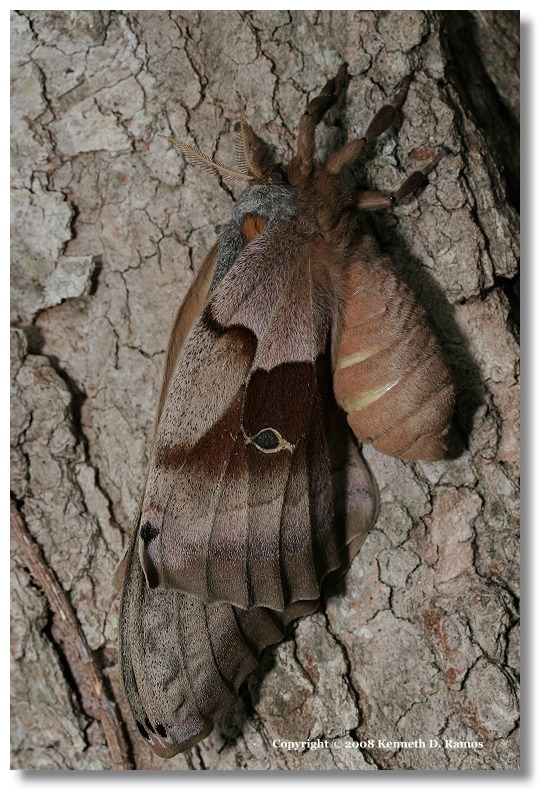 I took the moth over to the Gray Dogwood tree in my front yard, where I nudged it off on to the tree trunk in amongst some heavy leaves, where I could be reasonably sure a bird would not get to it. Like a proud parent with a new baby I kept checking in on it periodically to make sure it was alright. He's very lovely looking. Do you know what he is? And the way my laptop is, I saw the legs first and nearly had a fit. Very spiderlike.!! I have yet to look but I think that it is a Sphinx Moth of some type. The legs were quite powerful I suppose for a moth, I don't know a lot about them but they sure can grip, as I felt them as it crawled upon my hand out of the jar. Not sphingid, it is one of the giant silk moths. Thanks for the ID there Gordon, much appreciated and yes, Jim, I have had the cocoon since December of last year in hopes of this particular moment. Though I missed the actual emergance, it was still a joy to see, hold, and photograph the moth. These things do not waste any time either. Before leaving for work this morning I checked on the moths welfare. To my surprise, it had company and I caught the two lovers in the act. Deciding work would have to wait, I ran back inside for my camera and by the time I got back out, another missed shot! The male, I presume, had fallen away and was lying spent on the the ground, having hit head first, as you see in the photo below, a real "crash and burn" type of pose. Though I cannot recall ever having done that. But, then again it might have just been resting. Wonder if moths "smoke?" Bad for their health you know. 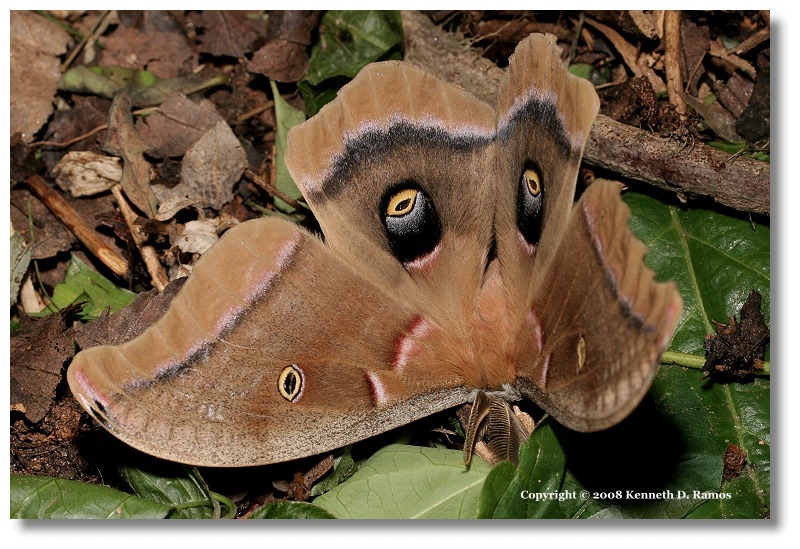 Polyphemus moth -- see BugGuide. These critters are great fun. Beautiful caterpillars too. The mating ritual you observed was unusual to say the least. 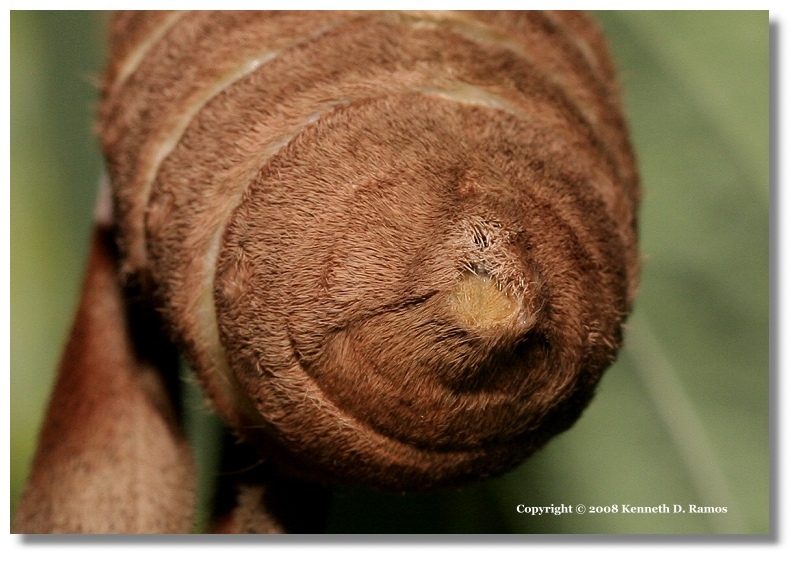 It's customary for the females to breed shortly after emergence, but from what I've seen the process usually takes hours, not minutes, and the male leaves intact. Wikipedia is explicit that the males can mate multiple times. I have no idea what happened to this critter of yours. The emergance took place around 4:30PM on the 18th, the moth was moved to the Dogwood tree about an hour or so afterwards and spent the night there. The photo of the male was taken this morning around 06:25AM after having fallen away from the female, so there was several hours for the mating to progress through. Ah, I misread the timeline! Now it seems that everything was perfectly normal and this was just the male's last hurrah, so to speak. Finding big moths is always a treat. They are getting scarce to non-existent where I live. Even the tomato sphinxes don't show up anymore. It seems as though your link to Wiki answered a question that I had and that was how does the female communicate that she is ready to mate? Pheromones, as I suspected. I collected the male for keeping, though it is still just bearly alive. Wiki also stated that the adults usually live about a week if I am not mistaken. So the male I have should expire here soon I would imagine. A perfect specimen it is too and so it is of to the "Nature Store" in Asheville for some mounting materials. A wonderful series Ken and a beautiful moth too. A pity it had to die so soon but I guess that everything in nature has a reason. Though I cannot recall ever having done that. Ken you might be doing something wrong??? I've enjoyed the ongoing episodes of this story. Did I miss something. Are you back in civilisation or did you find a satelite? Hi Craig. I am out in the glorious bush!! I did manage to find a satelite signal, but after moving I spend almost two weeks in bed with bronchitis so I only got back to work last week and am snowed under at the moment (with work not snow LOL!!) I have hardly taken a photograph lately with being in bed so long so I do not have much to post but will sometime soon. Thanks for asking. Thanks Joan (hope you are feeling better) and Craig. Glad that you enjoyed the series. I suppose that about wraps things up with this moth, unless I go out this morning to find a more eventful scene. If the moths mate several times, she may have another suitor, who knows eh? Thanks Ken. It will be nice to eventually be able to breath without my whole chest and throat burning like this and to be able to get one nights sleep without coughing the whole time. I was last sick more than 20 years ago so I am not used to being ill. But I am determined to survive in order to be able to bug you on the forum again.